Post weights used for thrusters and strings of unbroken box jumps to comments. Careful with those heavy thrusters today. If you start to experience ANY back rounding where you are losing neutral spine in the bottom of the movement (during the squat), back down the weight and form up. Be warned, those who go beyond capacity with heavy thrusters risk lower back pain. If you are lucky this pain will be only temporary. "So, isn't it better if we don't do them?" The over-all benefit of performing thrusters and heavy thrusters is immense. This mandates their use. There should be no reason you wouldn't do them safely. YEEEOOOWCH! A bunch of us got these today. Make sure you take care of your rips. Clean them. Wrap them. And let them dry. The VERY best way to take care of them is NOT to get them. I know you get into the moment when storming the workout, but this kind of thing can set your fitness back a week. When I know I'm going to perform over 50 pullups in any given workout I'll look for ways to alter my grip and change form on every set to prevent this type of thing. It doesn't always work, but most of the time I get pretty lucky with it. 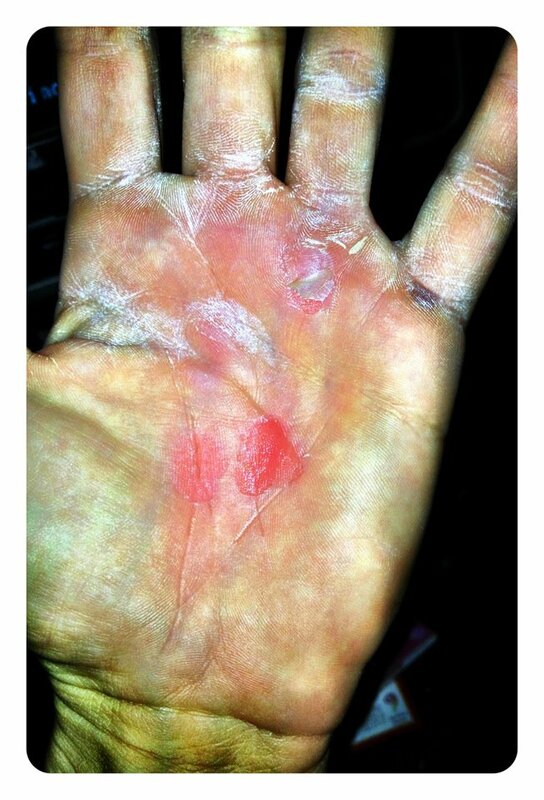 BTW those 2" bars (in the middle positions) take a little better care of your hands.